We've made another great round of improvements to the JKI State Machine Editor that we're excited to tell you about. quickly find/view state frames via a search filter string. Now, we're excited to tell you about a few more great features we've added. The biggest thing you'll notice is that we've integrated the Event Structure and Case Structure into a single tree view (see screenshot, below). All of the Event Structure frames have been added under the "Idle" ("Event Structure") item at the top of the tree. You can now easily navigate all the Event Structure frames and Case Structure frames from this single tree view, by clicking on the frame name. Drag & drop to reorder the Event frames, Use the Forward/Backward Navigation History Buttons, Search for Frames -- it all works just as you'd expect! 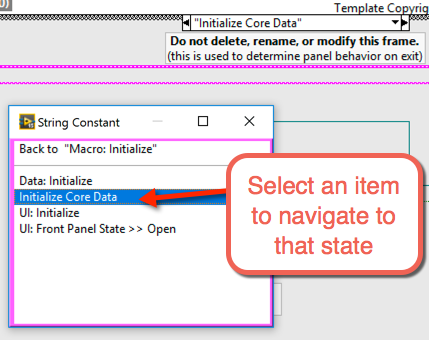 If you show the Context Help window (<Ctrl+H> or Help >> Show Context Help) and then hover over a frame name in the JKI State Machine Explorer's tree view, the Context Help window will update to show the documentation string for that frame. Another cool feature we added is the ability to Explore States on a state string constant. Simply right-click on a state string constant and choose Explore States (as shown below). This will open a dialog (shown below) that looks a lot like your string constant, and allows you to click on individual lines/states of the string constant, which will navigate the JKI State Machine to that frame. This allows you to quickly jump between frames if you'd like to navigate through the sequence of states in the string constant. Finally, we added a small usability improvement: we have grouped all of the right-click options for a state under a single submenu (as shown below) so that it's easy to distinguish them from other operations that applied to the JKI SM as a whole -- previously, all these options were all at the root level and started to get unwieldy. We hope you enjoy this latest round of improvements to the JKI State Machine Editor and it helps your write great code even faster. You can download the latest version of the JKI State Machine Editor with VIPM here. You can see the full release notes here. Love the JKI State Machine Editor? Tell your friends and co-workers, and do let us know @jkisoftware.